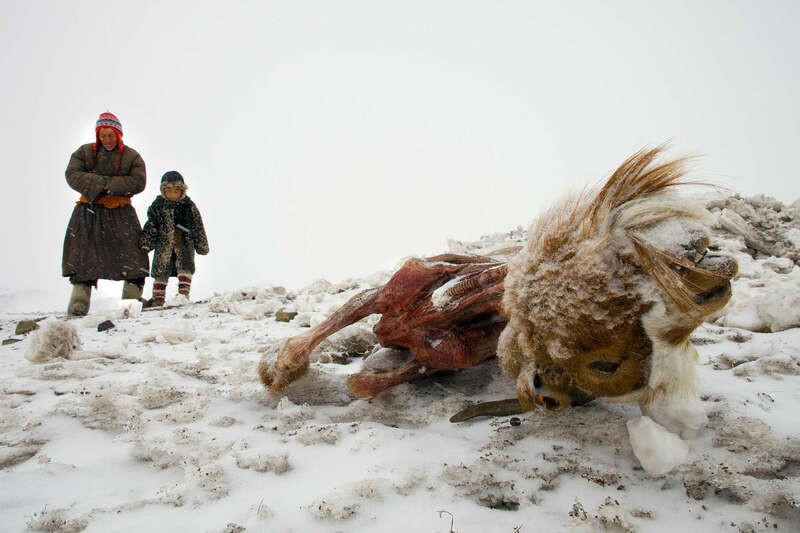 Dealing with another snowstorm, Muukhbayar,50, stands with daughter Javzmaa, age5, next to their goat that died from starvation in Sergelen, in Tuv province in Mongolia. The family lost 200 of their herd from 500, the family said that many herder nomadic families moved due to the severe cold and snow. Mongolia is still experiencing one of the worst Winters in 30 years with 68 % of the provinces effected. Presently the government has declared an emergency requiring foreign aid to alleviate the impact of the " Zud" ( Mongolian term for a multiple natural disaster) caused by bitter cold and thick snow.